Since we knew very little about the people in the album (they were mostly from the 1800's), I carefully took each photo out of its slot and photographed the back of each. This is likely a one time only operation as the paper is very weak and crumbles easily. Unfortunately, many were blank and we will never know who the people were. Of special interest were the photographers' graphics - I thought they would make a wonderful set of framed pictures (another project for "someday"). 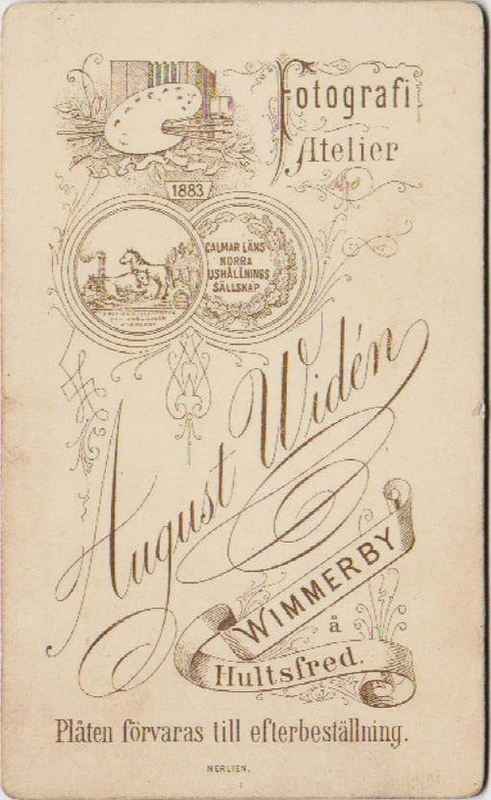 Some were written in Swedish and the photographer's shop was in Calmar Lans, one of the towns in Sweden from which members of my father's family immigrated. We visited that town when we lived overseas in the 60's.